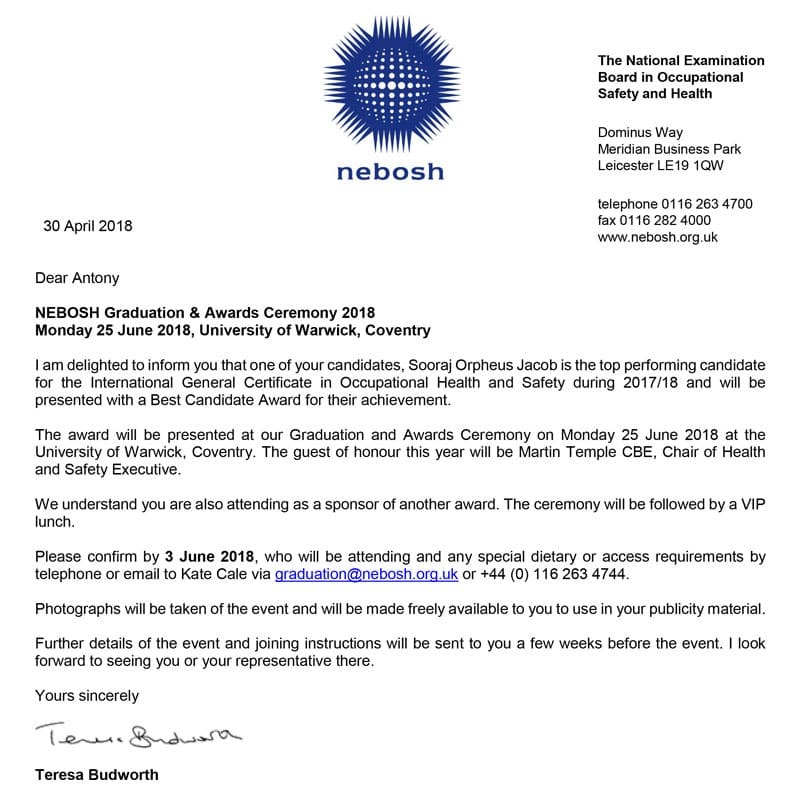 In a spectacular event, NIST promptly enters into the next league, attending the NEBOSH graduation ceremony 2018 at the University of Warwick. In what is unknown to the Indian community, NIST explores the unknown to cross shores to attend the NEBOSH graduation event. 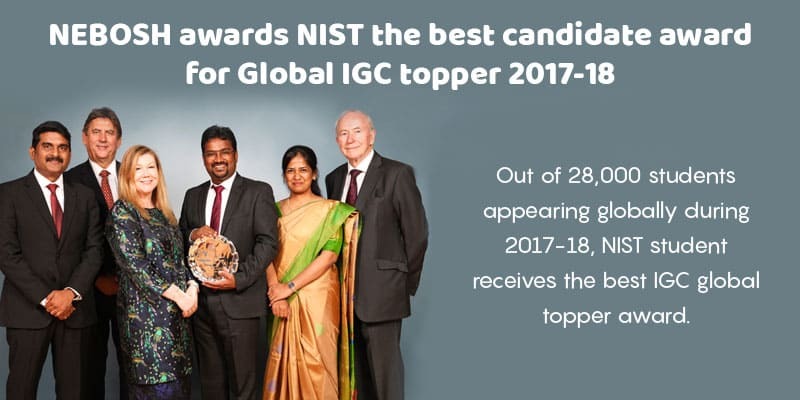 The achievements of NIST are plentiful, in the area of health and safety; and the recent graduation ceremony is a feather in the cap as far as NIST is concerned. Delegates from 59 countries have made their presence at University of Warwick, while some families accompanied participants. 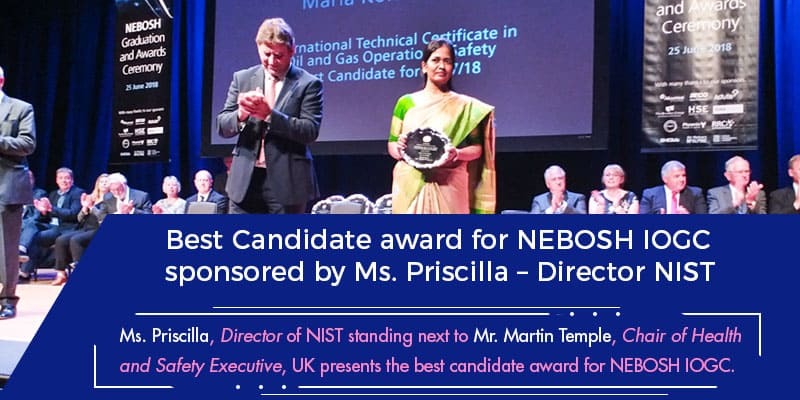 As part of this grand event, NIST had the privilege to sponsor the best candidate award for IOGC by our Director Ms. Priscilla. It is a prestigious achievement for our director to share the same diaz with the likes of the Chair of NEBOSH, Chair of Health and Safety Executive and many other dignitaries. More than that, we are also the proud sponsor of the event to fulfill our motto in contributing towards safety. 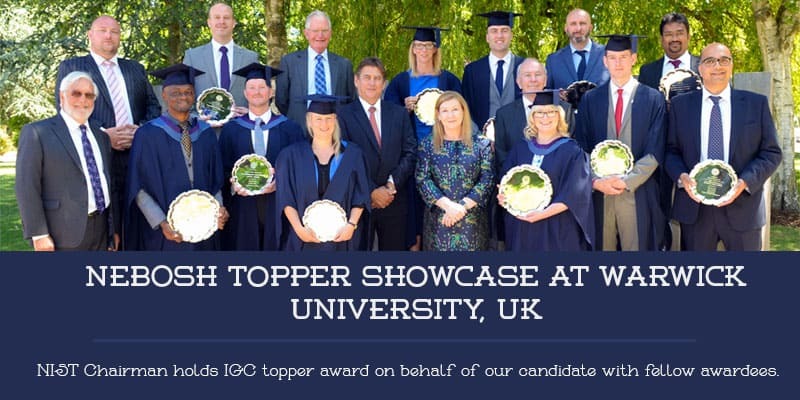 We would like to share another wonderful moment, wherein our Chairman Mr. Antony received the best candidate award on behalf of our student for Global topper in NEBOSH IGC out of 28,000 candidates globally appearing, and he showcased it among other toppers among other events. These achievements have greatly influenced the morale of our camp and the whole NIST team is elated and satisfied for the hard-work behind the entire success. 5 NISTians had the opportunity to be part of the Warwick ceremony and they cheered for each other during the award moments. NIST has sponsored the candidates for their to and fro trip to the University of Warwick, London, UK. Though NIST had humble beginnings during its start, today we stand tall among the international league with flying colors. Our students and professionals can be vastly benefitted with the quality of health and safety programs we implement at NIST. Towards the end of the awards ceremony, several dignitaries and NIST representatives were specially invited to be part of a VIP lunch along with the NEBOSH board members. Our directors had conversations with dignitaries to discuss about the business activities at NIST and possible opportunities. NIST is continually making progress and keeping its motto to contribute to Safety. Towards that end, the directors of NIST have worked relentlessly hard to take NIST to the international league. We take this moment to appreciate our directors and all the team at NIST who have directly or indirectly contributed to the success of this effort.